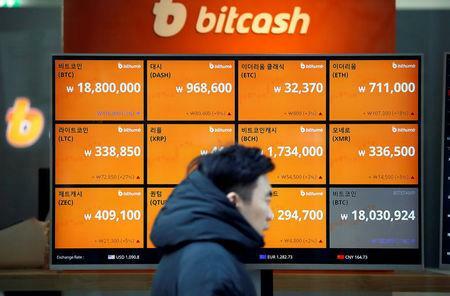 LONDON (Reuters) - Some of Europe's biggest venture capital firms are buying into sales of new virtual coins or asking their investors to give them the freedom to do so, in a sign of mainstream investor backing for the booming but controversial crowd-funding tool. Germany's HV Holtzbrinck Ventures, which has more than 1 billion euros ($1.23 billion) under management, is talking to its investors about changing the terms of its next fund so it can buy tokens directly, Jan Miczaika, a partner at the firm, told Reuters. Lakestar, the Zurich-based firm run by Klaus Hommels, has made at least four investments in crypto and blockchain-related businesses since early 2017, among them ShapeShift, an exchange, and Blockchain, a wallet provider, and it is preparing to invest in a combination of coin and equity stakes in more. Smaller and newer funds like BlueYard Capital and Fabric Ventures are focusing specifically on investments around blockchain - a distributed ledger technology that can remove the need for centralizing institutions - often by buying virtual coins. Venture capitalists usually take equity stakes in start-ups, gaining a say in how the company is run and legal and governance certainties over their investments. Buying into initial coin offerings (ICOs), as the sale of digital tokens is known, can be far more risky. They offer little more than a promise the tokens will be worth more in future. But with hundreds of start-ups - ICOs last year raised $6.3 billion - seeking to raise capital for new projects, investors say that to gain access to cutting-edge technology they need the flexibility to compete. "It's the internet in the early 1990s, you have to experiment," said Nicolas Brand, a partner at Lakestar. "I have to find the best way of backing the best entrepreneurs and we need to be agile in how we invest." Regulators have raised serious questions about the transparency of ICOs and the risks of scams, although authorities in countries from Switzerland to France have disclosed plans to attract new launches. Supporters say blockchain will disrupt industries from finance to logistics and that ICOs are a novel way of crowd-funding. Tokens are the route to make money. They embody the idea that consumers will need to own and use them to buy services, from playing computer games to online shopping. When demand for those products spreads, the token prices will rise, creating value for earlier owners like venture capitalists. "The (blockchain) technology is very exciting. Ninety-five percent of the tokens will go to zero. On the other hand, the other 5 percent are very interesting and could go on to revolutionize the market," said Miczaika at HV Holtzbrinck. Unlike some big U.S. funds, most big European venture capitalists are avoiding the world's biggest ICO, by messaging app Telegram, people familiar with the funds say, citing concerns about the amount - a reported $1.7 billion - it has raised. Broader worries about the quality of teams looking to cash in on ICOs are common, and some funds say that far from being a threat to the venture capital model, most ICOs are a fad. Those that survive will find themselves wanting the support and hand-holding that conventional venture investment offers. "We need to get our heads around ICOs, but I don't see it as a threat. I don't think I've missed a company which I wish I'd invested in but couldn't because it did an ICO," said Suranga Chandratillake, partner at London-based Balderton Capital. To date, venture activity has focused on crypto companies like HV Holtzbrinck's investment in ICO platform Upvest or Point Nine Capital's stake in peer-to-peer bitcoin lender Bitbond, which tapped into the crypto-trading craze and followed on from a series of investments by well-known U.S. venture funds. Investors said the next round of activity would target projects offering the building blocks for blockchain's development, such as software development networks. They will benefit if the largely unproven technology matures. Buying into the coins is necessary for aligning themselves to such projects, they argue. "We came to the conclusion that if we really want to do decentralised tokens we have to be a part of it," said Ciaran O'Leary, who co-founded Berlin-based BlueYard and invested in the 2017 ICO by data storage network Filecoin, which was worth an estimated $200 million. ICOs also present major governance and legal concerns, including how to store coins safely after several large hacks. To keep their investments safe, venture firms are looking at storing coins offline or in wallets where no transaction can take place without the agreement of multiple individuals. Max Mersch, a partner at Fabric Ventures, said his firm had also introduced multi-year lock-ups prohibiting quick dumping of coins, to encourage longer-term investment horizons and so partners had time to shape governance. Risks aside, venture capitalists say the potential impact of tokens is too hard to ignore. "A token is a very powerful innovation and in the best token projects, the fund-raising is actually a byproduct," said Lakestar's Brand said. "The token is about activating network effects on steroids," he said, predicting they would have the power to take on "rival monoliths like Facebook".